One of the most anticipated concert tours of 2013 will kick off in less than two months as Kanye West readies for his 2013 North American tour. Epic Nation Tickets is proud to announce a large supply of Kanye West tickets available before the general public sale. Luckily for many music fans Epic Nation Tickets will have premium Kanye West tickets for all tour stops before the general public on sale dates. One of the most enigmatic and sometimes controversial musicians of all time has announced his long awaited 2013 tour. Whether you care for Kanye West or not, his music is often part of the mainstream conversation all across the world. Beginning in just a little over a month, Kanye West will embark on a 7-week tour, aptly called the “Yeezus” tour. Luckily for many music fans, Epic Nation Tickets will have premium Kanye West tickets for all tour stops before the general public on sale dates. Kanye West has not embarked on a tour since 2011, when he toured alongside Jay-Z. Since then Kanye has continued making music, including his latest album “Yeezus” and topping the charts yet again. Kanye West has also made headlines in his personal life, having a child with reality TV star Kim Kardashian. While some consider Kanye West very polarizing, he puts on one of the best shows in all of music. For that reason alone, Kanye West tickets will be hard to come by for most upcoming tour stops. Epic Nation Tickets will be the best source for Kanye West tickets for the tour starting on October 19. Kanye West concert tickets will be on sale to the general public on September 13 for most shows, but fans will be able to take advantage of pre-sale tickets from Epic Nation Tickets. Many shows on this nearly two-month long tour will be accompanied by rising rap star Kendrick Lamar. Kanye West’s “Yeezus” tour will invade such cities as Seattle, Los Angeles, Las Vegas, Chicago, Brooklyn, New York City, Washington, DC and more! 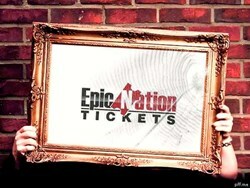 Epic Nation Tickets is the home to the best deals on tickets to concerts, sports, Broadway shows and Las Vegas acts. All ticket transactions come with a 125% guarantee. Those interested in Kanye West tickets also may be interested in Justin Timberlake or Jay-Z tickets.